Sediment particles in the bed of a river move under the action of gravity and forces generated by flowing water. Yet, predicting exactly when a grain of sediment will move is difficult to do. In this project, we are seeking to (1) identify the time-varying hydrodynamic signatures that lead to the generation of forces that are high enough, and operate over a long enough time period, to cause sediment to move from a stable resting position; and (2) to quantify how this signature changes under a range of flow and bed conditions. To accomplish this task, we have designed a new optics package for providing illumination for PIV and a mobile instrumented particle that can measure forces leading up to motion and the acceleration experienced by the particle once motion has commenced. Image: An instrumented particle being entrained from the bed. Student: Brandon Dillon. Paleoceanographers hypothesized that the mean size of coarser silt (10-63 µm) in mixed clay-silt deposits is directly related to the velocity of deep-sea bottom currents (McCave et al., 1995). This flow speed proxy has been termed 'sortable silt' because the coarser silt is interpreted to size-sort by selective entrainment and deposition. However, the sortable silt hypothesis has little field or laboratory validation. We are experimentally testing the relationship between velocity of currents transporting and depositing a mixture of clay and silt. Student: Jeff Culp. Collaborators: Brian Romans (PI) and Drew Parent. Funding Source: ACS Petroleum Research Fund. Image: Mud deposits on the bottom of a flume in a unidirectional current. Alluvial fans are active landscapes that are built and modified by deposition of sediment and the switching or avulsing of a rivers location from on place to the next over the arc of the fan. The dynamics of such systems increase hazard potential to infrastructure and human life in mountainous environments. In this project we are examining the general avulsion cycle of experimental alluvial fans with mixtures of cohesive sediment and sand over a range of boundary conditions. The purpose of doing so is to experimentally produce realistic fan dynamics that can then be used to better understand and quantify the sensitivity and risk associated with these landscapes to a changing climate. Funding Source: ExxonMobil Upstream Research Company. Image: Topography scan of developing system. Students: Nilay Iscen. 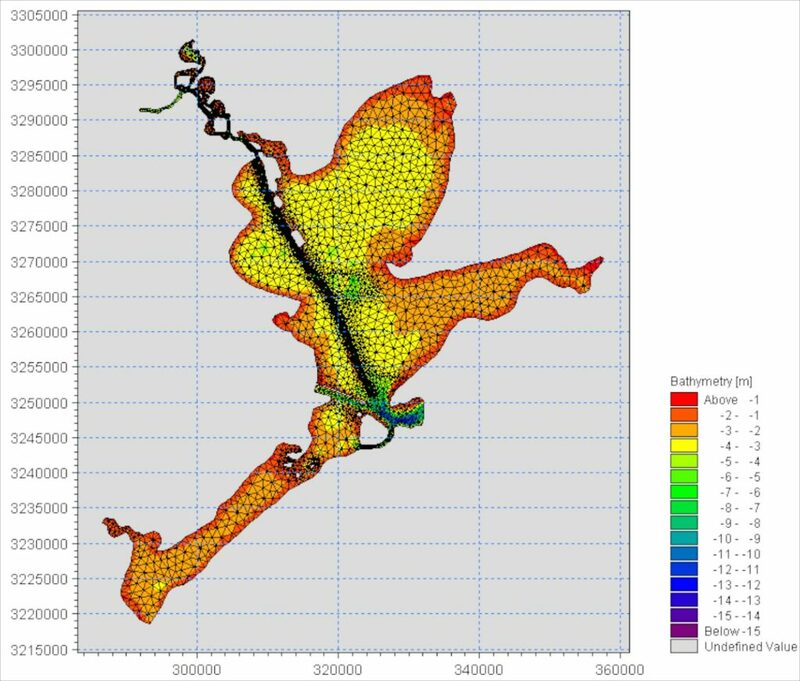 This project investigates the impact of flocculation on sediment transport and morphodynamics in estuaries, deltas, and turbidity currents. The cohesive forces at work within mixtures of clay and silt sized inorganic and organic mud impact, (1) the depositional rates of suspended sediment through the flocculation process, and (2) the erosion mechanics of a mud bed through time and depth dependent erosivity. The net result is that predicting and interpreting mud deposits in estuarine and turbidity current settings is complicated by the fact that the settling velocity and incipient motion condition are not necessarily directly related to the size of the individual particles in a deposit. The goal of this project is to improve understanding and modeling of flocculation processes in turbulent flows during deposition and erosion of mud. Funding Source: ExxonMobil Upstream Research Company. Image: Mud flocs in a turbulent field after 6 hours of mixing at 400 mg/l. Students: Duc Tran and Rae Kuprenas. Pulses of ﬁne sediment composed of sand, silt, and clay can be introduced to gravel bed rivers through runoff from burn-impacted hillslopes, landslides, bank failure, or the introduction of reservoir sediment as a result of sluicing or dam decommissioning. Yet, what exactly happens to pulses of suspended is unclear, and engineers and earth scientists have tractable method of estimating the loss of suspended clay to gravel beds. This project uses laboratory-based experiments to investigate and quantify the loss of suspended clay to gravel open and sand-filled framework gravel beds. Image: A muddy suspension flowing over an open framework gravel bed in one of the BEHL flumes. Student: Christian Mooneyham. Submarine fans are complex distributive channel environments that represent the final sediment sink for the fluvial/marine system. As with other types of distributive systems, e.g., deltas and alluvial fans, submarine fans likely have an internal cyclicity associated with autogenic channel formation and abandonment. This research investigates the hydraulic and sediment transport conditions and processes associated with the self-formed submarine channels and terminal deposits that avulse and migrate in time to build the larger fan surface. The work is being conducted in a laboratory tank and couples density current velocity measurements and high-resolution surface mapping to capture the density current hydraulics and morphology evolution of the fan surface in space and time. 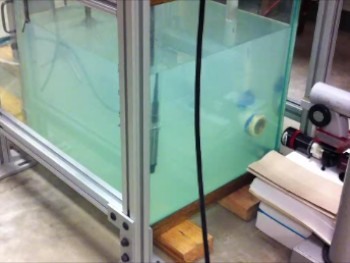 These experiments aim to improve understanding of fan building under supercritical turbidity currents. Funding Source: ExxonMobil Upstream Research Company. Image: overhead picture of self-formed subaqueous channel and fan. Student: Paul Hamilton. The overall health of the Chesapeake Bay is tremendously affected by the sediments suspended in its water system. The mud that dominates the bay has a very slow settling velocity, and thus can be transported over long distances. Where and when the sediment is deposited is entirely dependent on the settling velocity of the particles. However, predicting the settling velocity of the mud is difficult because the sediment particles can stick together, forming flocs, due to the added cohesion of clay. The break-up and coalescence of these flocs is dependent on environmental conditions such as sediment type, water column chemistry and biology, and turbulence levels. Since the amount and type of sediment in the Chesapeake Bay varies seasonally, it is likely that mud floc sizes, and hence settling velocity, may also vary seasonally. The broad goal of this research is to advance our ability to model flocculation, and therefore fine sediment dynamics, in the Chesapeake Bay. Funding Source: Virginia SeaGrant. Image: early morning on the Chesapeake Bay. Student: Rae Kuprenas. This work focuses on depositional processes in buoyant, mud-rich river plumes in deltaic settings. 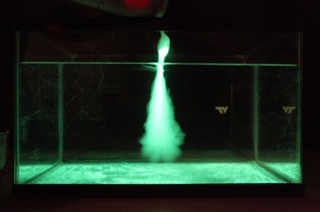 The speed at which sediment is removed from such plumes is thought to scale with the settling velocity of the individual or flocculated particles in the plume, i.e., with sediment size and excess density. However, some studies suggest that vertical flux may not be so simple. Various instabilities can result at the density interface that lead to more complicated depositional processes that may be a function of more than individual particle sediment size. 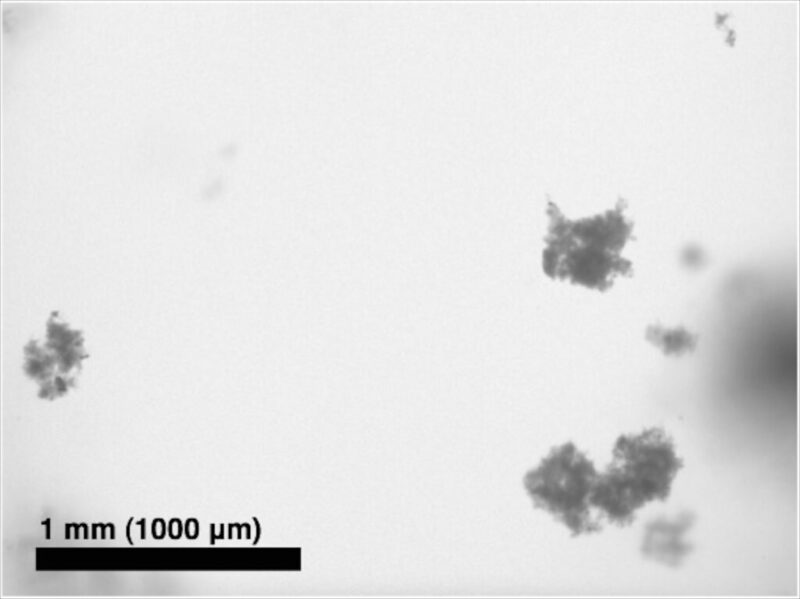 This work compares the vertical transport rate of flocculated mud settling as individual particles to vertical transport rates in stationary and moving stratified layers. Funding Source: ACS Petroleum Research Fund. Image: Convecting sediment laden fingers of interface fluid. Student: Mohamad Rouhnia. The concept of a river at grade is useful for building a framework from which to understand the trajectory of a river with time in response to imposed boundary conditions. Inherent in the concept of a graded river, and equilibrium functionalities and equations such as Lane's balance, is the notion that the river is responding to some characteristic channel-forming discharge. The channel forming discharge is typically taken to be either the bankfull discharge or the discharge that moves the greatest amount of sediment over a significant number of years, i.e., the effective discharge. In this project, the effective discharge will be calculated at several USGS gaging stations along the Trinity and Guadalupe rivers using measured and calculated sediment loads. These values will then be compared to pure flow metrics of bankfull discharge and the 2 year return period flow. Using a simple 1D morphodynamic model, the project will also explore ideas related to the grade concept and the impact of small run-of-the-river dams on the Guadalupe River between Seguin and Gonzales. Funding Source: the Texas Water Development Board. 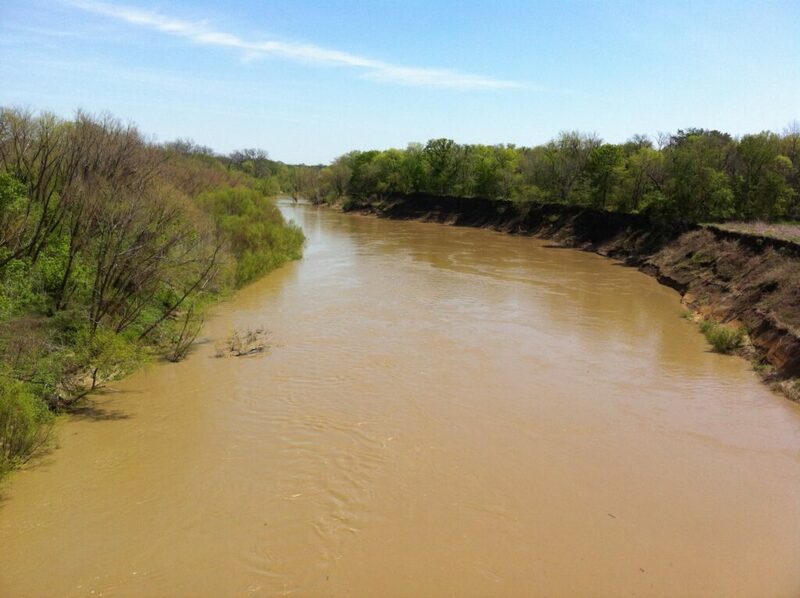 Image: the Trinity River near Rosser, TX on April 5, 2013. Students: Hossein Hosseiny and Jaxon Gluck. The goal of much of our flocculation and convective settling work is to better understand sediment transport in fluvial to marine transitions. Since turbulent energy and salinity both change in fluvial to marine transitions, the dynamics of flocculation and convection may exert significant control on the eventual distribution of sediment in these zones. We are investigating the evolution of floc size experimentally and numerically as a function of time under changing shear conditions, and we are examining how these changes may influence deposition rates of mud in coastal zones through modeling of river mouth plumes. 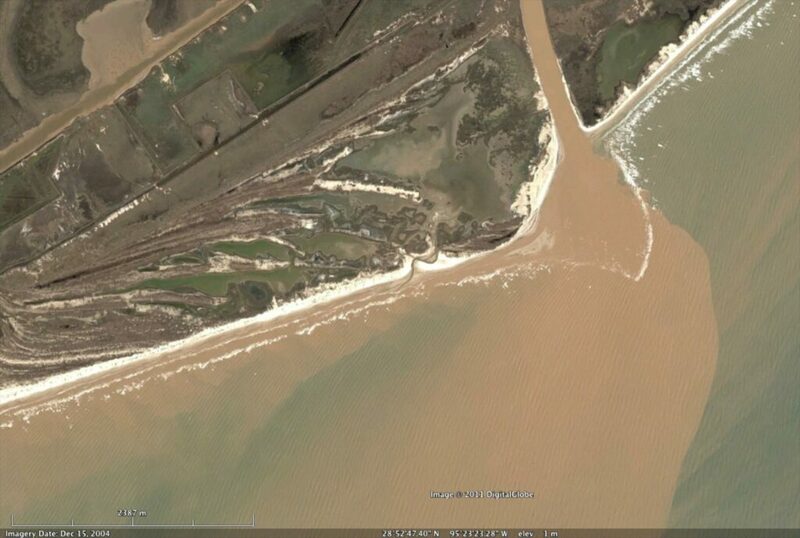 Image: Brazos River coastal discharge December 15, 2004 - Google Earth. Students: Ali Keyvani. Several studies have shown that calibration equations can be developed to link the backscatter strength recorded by acoustic Doppler velocimeters with average suspended sediment concentration (SSC) when the sediment particle size distribution remains constant. However, when mud is present, the process of flocculation can alter the suspended particle size distribution. Past studies have shown that it is still unclear as to the degree of dependence of the calibration equation on changes in floc size. Part of the ambiguity lies in the fact that flocs can be porous and rather loosely packed and therefore might not scatter sound waves as a solid particle would. In addition, direct, detailed measurements of floc size have rarely accompanied experiments examining the dependence of ADV backscatter and suspended sediment concentration. In this set of experiments, direct measurement of the floc size distribution are made with time in a mixing chamber using a floc camera system. A Vector ADV and an OBS are also placed within the tank to measure acoustic backscatter and SSC as the flocs change size with time. Funding Source: ACS Petroleum Research Fund. Image: experimental setup with ADV, OBS, and floc camera recording data within a mixing chamber while flocs grow in size. Students: Mohamad Rouhnia, Ali Keyvani, Mehrdad Salehi. The goal of this work is to assess the soil carbon loss due to rainfall driven soil erosion within the urbanized Buffalo Bayou Watershed in Houston, Texas. The contribution of soil organic matter, originating from soils with different compositions, to suspended sediments in runoff, will be derived using soil organic carbon erosion rates and stable isotope ratio (δ13C, δ15N) measurements. The project, led by Iftekhar Ahmed of Prairie View A&M University (PVAMU), is a collaborative effort between PVAMU, Texas A&M University, and the University of Houston. 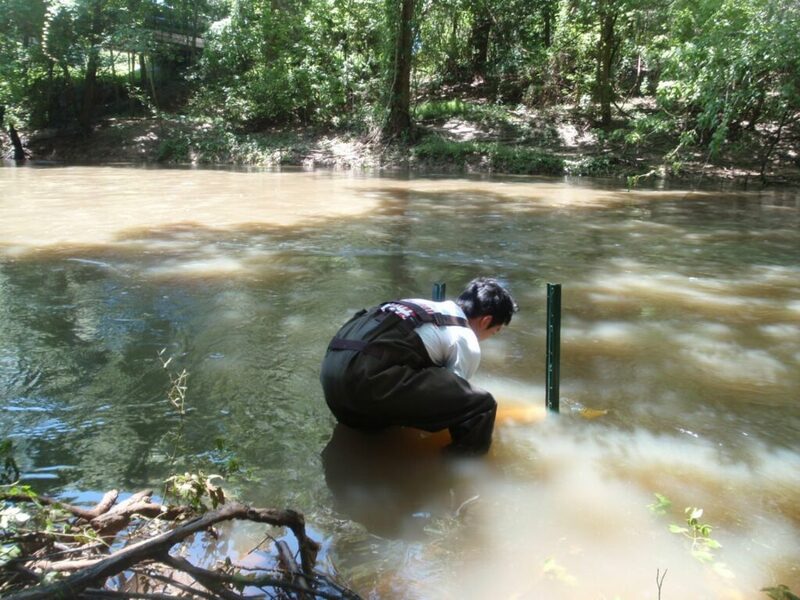 The University of Houston is primarily responsible for collecting samples of suspended sediment during high and low flow conditions in the bayou. Funding Source: US Department of Agriculture. Image: installation of a suspended sediment trap in Buffalo Bayou. Students: Sky Zhang, Duc Tran, Frederic Ma, Jaxon Gluck, William Regner, and Daniel Timme. Experimental work has indicated that mesoscale reach morphodynamics may play an important role in the development and regulation of distributive channel systems. These mesoscale morphodynamics account for the cyclic occurrence of channel extension, deposition, backfilling, and avulsion or re-extension via downstream control explaining stratigraphic complexity that is averaged out in more classic macroscale models. This research extends the previous work on distributary systems by examining mesoscale morphodynamics and hydraulics on supercritical alluvial fans. The hydraulics associated with non-cohesive distributive systems are studied through a set of laboratory experiments on alluvial fans. During fan development, flow depth and velocity is quantitatively measured in space and time using Large Scale Particle Image Velocimetry (LSPIV) and morphologic growth dynamics are captured with images. The study will test the hypothesis that supercritical channel flows in non-cohesive distributive systems are inherently unstable and lead to mesoscale morphodynamic feedback cycles that push the system to an overall critical and regulated state. Funding Source: ExxonMobil Upstream Research Company. Image: Plan-view image of developing fan. Student: Paul Hamilton. The goal of this research is to answer the following two questions, (1) where does sediment arriving in the system from the San Jacinto River, the Trinity River, and Buffalo Bayou end up under typical fresh water inflow and tidal conditions? And, (2) how are salinity conditions and sediment transport patterns in the system impacted by drought and wet weather conditions? Our approach to answering these questions is to use a coupled hydrodynamic and morphodynamic model of the San Jacinto Estuary as a numerical laboratory. The modeling for this research is being conducted using the package MIKE. Funding Source: Texas Hazardous Waste Research Center. Student: Mehrdad Salehi. The lower Brazos River has undergone change over the past 100 years with construction of upstream dams and a shift in land use from prairie, savannah, and coastal marsh to more developed agricultural and urban areas. While the installation of the upstream dams appears to have had little impact on the hydrology of the lower Brazos, a better understanding of the flow and sediment needs of the ecosystem have been highlighted as valuable information for the future by the Texas Legislature. We are conducting suspended sediment sampling on the lower Brazos River at six USGS gaging sites as part of the Texas Instream Flow Program in cooperation with the Texas Water Development Board. The goal of the work is to measure the size of the material in motion during a range of flow events, develop sediment rating curves for each site, and to determine the effective discharge and yearly sediment loads at each site. 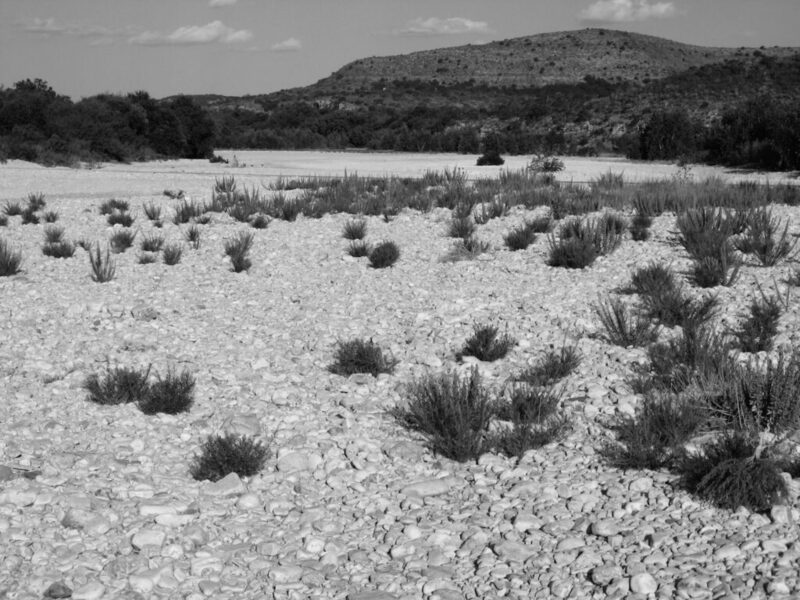 This information will be used to aid development of 1) sediment budgets on each of the five reaches and 2) the consideration of fluvial transport in determining the environmental flow regime required for the lower Brazos. Funding Source: Texas Water Development Board. 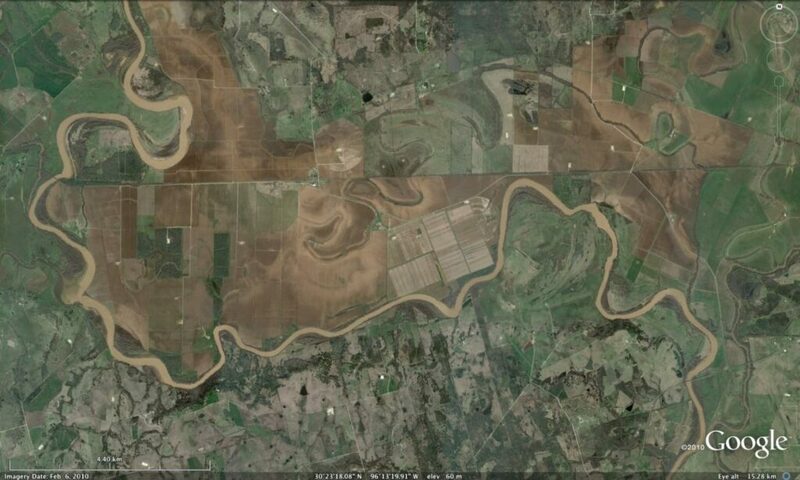 Image: the Brazos River north of Hempstead, Tx. Students: Mohamad Rouhnia, Mehrdad Salehi, Guillermo Machado, ￼Miguel Albuja, and Frederic Ma. In cohesive muds, conditions for deposition and erosion of the sediment boundary are dependent on several factors such as the flow history responsible for developing the bed, the local sediment composition, biological activity within the bed, the water content of the bed, and the salinity of the water column. 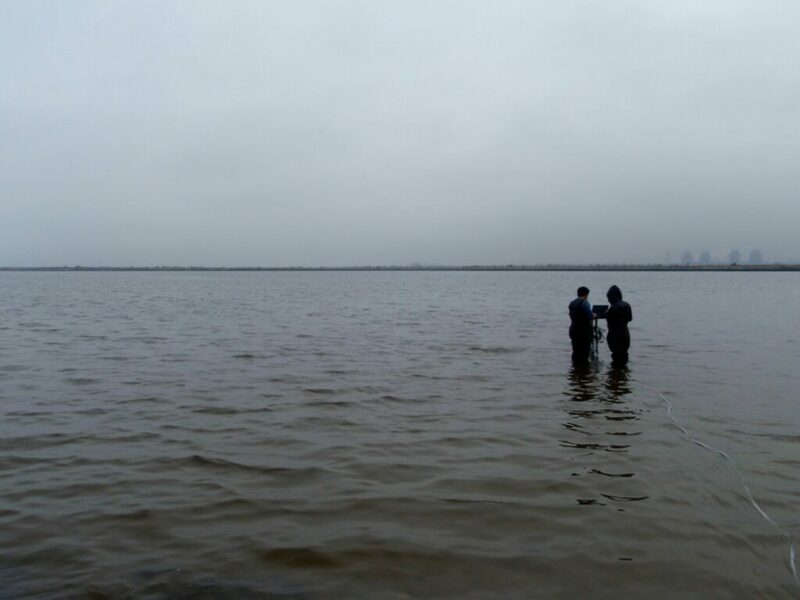 We are currently doing work to examine the local directional fluxes of sediment in the Galveston-Bay / Houston Ship Channel region to assess deposition and erosion conditions; these fluxes include the local translational advective flux and deposition and erosion during the flood and ebb tides. Acoustic Doppler velocimetery is used as the primary means of both turbulent flow measurements and suspended sediment concentration — this is done by using of the strength of the returning acoustic signal as a surrogate for concentration. As part of this work, we are also studying the ability and methodology of making simultaneous measurements of turbulent flow and suspended sediment concentration with acoustic velocimeters. Funding Sources: Texas Hazardous Waste Research Center. Image: Wooster Point near Scott Bay - Baytown Nature Center. Students: Mehrdad Salehi. In natural settings, cohesive sediments in suspension often exist as flocs which can both grow and decay in size as a function of the sediment and nature of the turbulent flow. Turbulent shear is generated by small-scale eddies which cause flocs to both collide and grow in size and to break up. An implication of the flocculation process is that the settling velocity, an important parameter for sedimentation and transport of suspended sediments, becomes a dynamic function of the particular sediment and turbulent flow conditions; this is due to the fact that floc size, shape, and excess density can all change as a function of the particular flow conditions. We are experimentally examining floc particle size distributions and settling velocity dynamics under variable conditions using Kaolinite and natural sediments from the Galveston-Bay / Houston Ship Channel estuary. Particle size distribution data and fall velocity are measured non-intrusively with an imaging system capable of measuring particles in the size range of (10 micron to 3 mm). 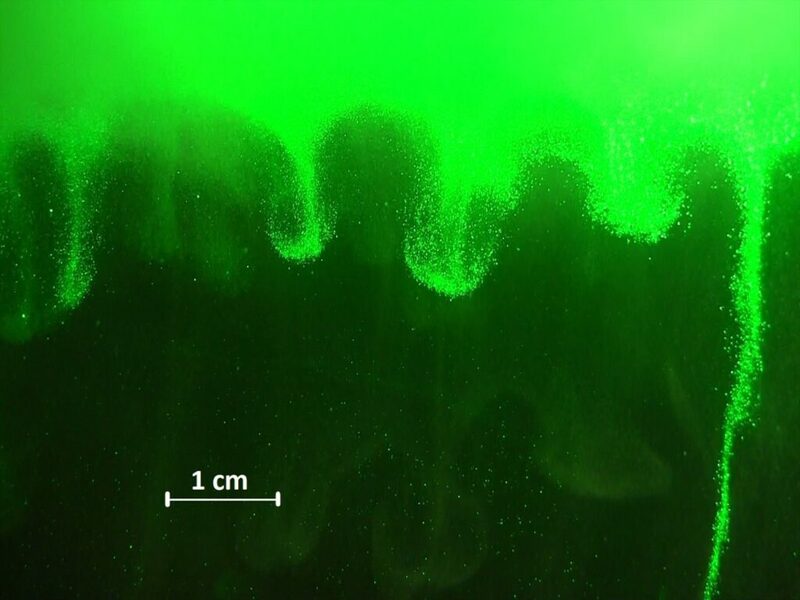 This work is part of a larger TMDL research development project for PCBs in the Houston Ship Channel region being conducted by Dr. H. Rifai at the University of Houston. Image: sediment flocs formed at conditions of: salinity = 10 ppt, turbulent shear rate = 10 s-1, and suspended sediment concentration of 150 mg/l. Students: Remya Kumar, Ali Keyvani, David Zettlemoyer, and Jordan Boucher. 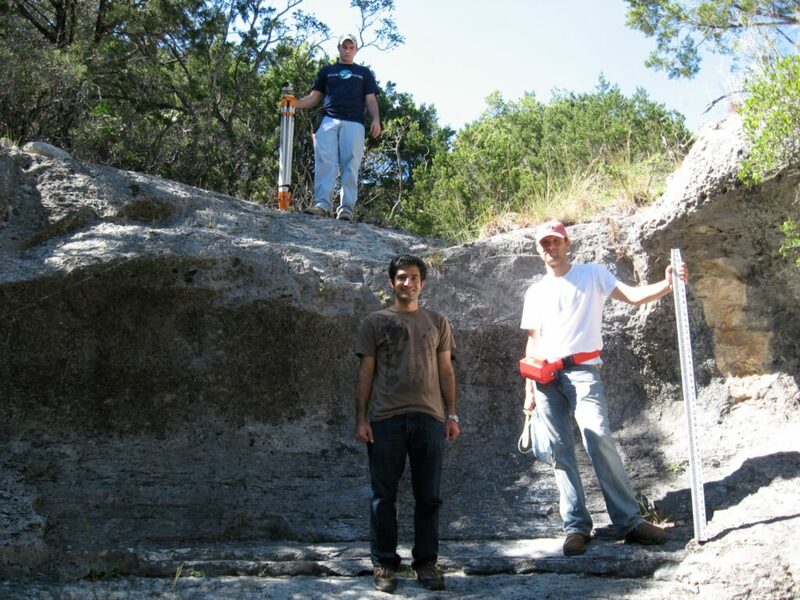 Studies in the fluvial environment often require characterization of the bed material grain-size distribution for purposes such as obtaining roughness length-scale estimates, sediment transport calculations, geomorphic/aquatic habitat classification, and general monitoring. 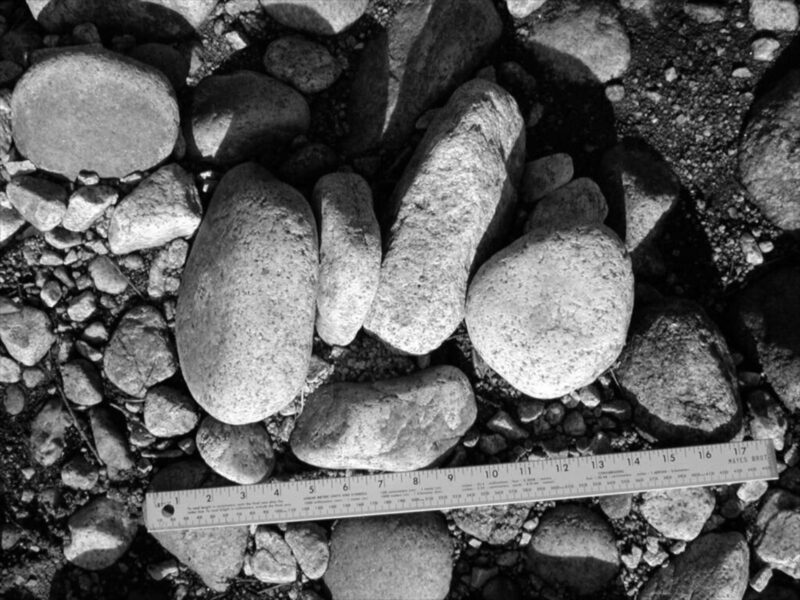 Surface layer sediments in gravel bed rivers are often characterized with pebble counts which require an operator to select and physically measure the axes of the individual grains or characterize them with a sizing template. In recent years, image analysis procedures have been used to automatically extract grain-size information from digital images of sediment beds. This method has the advantage of significantly reducing field time for sampling, sampling the bed sediments non-intrusively, and obtaining samples over a smaller sampling footprint to keep from blending spatial heterogeneity; the major drawback to the method is that it can only measure the size of the particles as-they-lie in the image. Our research focuses on 1) optimizing standard image processing procedures to best measure the particles as-they-lie in the image, and 2) comparing grain size distributions obtained with different pebble count methods and the automated image processing method. ImageJ macro with sample images for the processing procedures outlined in Strom et al. (2010). Funding Source: UH New Faculty program and NSF REU in Civil Engineering at UH. 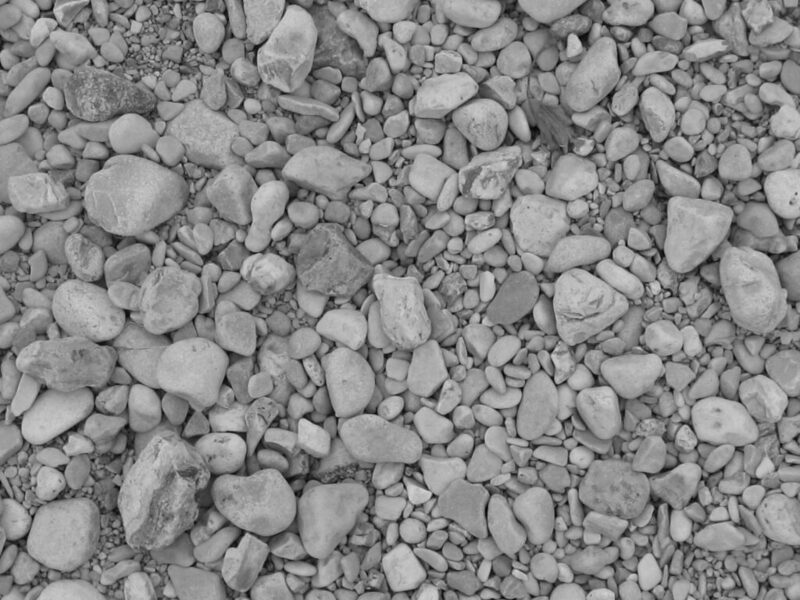 Image: exposed gravel. Students: R. D. Kuhns , H. J. Lucas, and A. B. Lindelof. My masters and PhD work with Thanos Papanicolaou focused on various processes associated with organizational structures called “clusters.” Clusters impact the local dynamics of gravel bed rivers by introducing perturbations from a non-clustered state in bed stability, downstream particle movement, bedload transport rates, overall flow resistance, and local flow field characteristics. Some of the key findings from the body of work were that 1) organized groupings of particles can form in uniform sized material under turbulence driven sporadic transport; 2) that clusters can act as sources or sinks to incoming sediment depending on the relative level of applied stress; 3) that cluster spacing appears to be proportional to the ratio of the largest stone in the cluster to the local channel slope; and 4) that clusters are typically found in riffle-pool reaches.